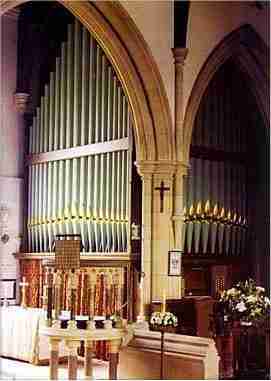 Restoration of the 1876 Father Willis Organ in All Saints' Church, Marlow, Buckinghamshire. All Saints' Parish Church, Marlow, occupies an idyllic setting on the Buckinghamshire bank of the river Thames. The medieval building, which had paid for this "ideal" location with a history of inundations, was entirely replaced in a sequence of rebuilding works lasting from 1831 to the end of the century. The Willis organ essentially dates from 1876, although contemporary references to the contract view it as a reconstruction of an earlier instrument. Being periodically exposed to the elements by the ongoing works to the church fabric, this organ was frequently subject to repairs and improvements until the twentieth century brought a period of relative stability. When we were first asked to inspect it in 1990, it was 35 years since any major work had been done, this being a rebuild by the John Compton Organ Company which saw the introduction of electro-pneumatic action, the modest expansion of the specification using the extension principle, and the provision of a new stop-tab console. The 1955 rebuild was notable for its contrasting treatment of the organ's interior and exterior. The new key and stop actions were at least competently made, and despite the tonal changes, the existing Willis pipework was in the main respected. The roll-top console was however more appropriate to a cinema than a place of worship, and those responsible for its installation had not merely been content with patching over the space occupied by its predecessor using thin plywood, but had actually sawn away a section of the original impost rail moulding where it impinged on the new music desk. The scheme eventually adopted in the restoration of 1996-1997 took its cue largely from this almost paradoxical situation. Apart from a few minor alterations to the specification which would bring it closer to its Victorian origins, the tonal balance was to be left untouched but the visual impact of the instrument was to be radically improved, not least by the building of a new drawstop console. Budgetary considerations ruled out a return to mechanical action, although this would have in itself sparked a debate over the most suitable form to recreate, Willis himself having taken the earliest possible opportunity to add a Barker lever to the Swell and tubular pneumatic action to the Pedal! The design stage of the project began in the Spring of 1996, in order to ensure that the new console would be completed in good time. A site survey was undertaken of an organ in our care at St Dominic's Priory, Gospel Oak, which is a Willis of a similar vintage. In no way have we attempted to create an exact replica but, by drawing heavily from the Victorian model for the keycheek profiles, jamb layout, engraving style and other details, we have sought to instill the new console with the appropriate degree of austere nineteenth-century solidity. In other respects, what has been created is a state-of-the-art assemblage of late twentieth century technology. The keys have been covered in a synthetic ivory substitute that possesses the hygroscopic qualities of that material which are invaluable for prolonged playing, without the attendant environmental degradation. The drawstop solenoids are controlled by a solid-state capture system with 8 memory levels (adjustable at the console), 8 pistons being provided per department as well as 8 generals. A new radiating and concave pedalboard with solid oak naturals and ebony sharps, built to the dimensions currently specified by the Royal College of Organists, has also been fitted. Parishioners would not necessarily have been aware that any work was underway until our site team arrived in early October and began spreading the instrument's innards along the south aisle. Inside the casework, the organ was being thoroughly cleaned out and stripped down to its core elements of bellows and soundboards on supporting framework. A few seriously damaged pipes, as well as the Compton underactions and drawstop motors, were sent back to London for factory attention. As is so often the case in organ building, this initial phase of frenetic activity gave way to one of patient and painstaking attention to detail as pipes were being individually inspected and cleaned, and action motors carefully stripped back to their timber boards and releathered. To guarantee compatibility with the new note-switching system, and to comply with modern electrical codes, each of over 400 pre-war Compton chest magnets was replaced with new, and the cotton-covered low-voltage wiring was rerun in PVC-insulated multicore cable. During the autumn we were pleased to welcome visitors from Marlow at our Bethnal Green workshops; they were able to view the console which was now nearing completion, whilst in the voicing shop the new Swell Vox Humana was making its first sounds. The scaling and constructional details for this stop were derived from another contemporary instrument, the Union Chapel in Islington. We have faithfully reproduced both the overlength boots in the middle compass and the harmonic resonators in the top octave. After careful consideration, it was decided not to adopt such a rigidly historical approach when upgrading the Swell Mixture from two ranks to three. Although Willis would almost certainly have provided tierce ranks, we have used only fifths and octaves, but have followed the original practice of employing a slightly narrower scale for the quints. The first rank is still a nineteenth in the bass but breaks back to the fifteenth and the twelfth sooner than before (respectively, half an octave and one whole octave). With a Sesquialtera on the Great, and two reed choruses available across all three manuals, this particular tonal enhancement offers greater variety rather than period authenticity. Hopes that the organ might at least partially be playing by Christmas were dashed when it was realised that the Swell soundboards were in need of more serious attention than was practicable on site. Splits in the solid timber grid tables had been "made good" using inappropriate short term expedients; in places the tables were no longer firmly attached to the bars, and "runnings" were audible at the console as wind escaped from the tone channels of some notes into the sensitive treble pipes of others. As it was intended that the present rebuild should leave the organ in good working order for decades to come, the only viable option was to return the soundboards to the works for a thorough overhaul. Splits in the tables were properly pegged to intercept any escaping wind, and the tables were then screwed down to the grids. The tone channels were flooded with hot glue and the pallets were covered in new felt and leather, then re-fitted. The slides were blackleaded and provided with expandable seals to ensure smooth and windtight operation at all times of the year. In December the console was installed on its new platform. This brought into focus something which we and those at Marlow responsible for the project had long suspected; the instrument's immediate surroundings were not consistent with its restored beauty and dignity. The parish had already taken the bold step of commissioning north London art specialists Campbell Smith and Co. to paint the zinc front pipes; the mouths have been gilded while the colour for the feet and bodies was selected from the beautifully restored chancel vault. The challenge now was to undo some of the less-inspired modifications to the casework dating from the post-war rebuild. All traces of the former console platform have been completely removed and replaced with a new hardwood floor, stained to match the main case. The thin plywood and hardboard sheets which used to cover over various gaps in the front case area have also been taken down; framed panelling, with scrolling and mouldings derived from the Victorian originals, has been put in its place. To complete the scheme, the decorative rails across the front of the display pipes on both the south and west case elevations have been reconstructed. The result is the transformation of the organ from a featureless mass in the corner into an attractive item of church furniture. The final phase of tonal regulation began soon after our return to site following the Christmas break. Rank by rank the pipework was reinstated to its appropriate departments, checked for balance, and finely tuned. The only stops which were considered to need loudening were the Compton extensions to the 16' Pedal Open Wood, which are now more effective at 8' and 4' pitch. This retention and development of features alien to the organ's original aesthetic might seem at odds with the current trend towards strict historical restoration, encouraged by the criteria of the Heritage Memorial Fund to which more and more churches are now turning. As a company we are proud of our own track record in this field but would insist that this particular contract be judged in the context of our portfolio of other historically-informed rebuilding projects. As at Great St Mary's, Cambridge (Father Smith and William Hill); and Christ Church, Cranbrook (E M Skinner and C W McManis); we have trodden a fine line between respecting what survives of the original instrument and appreciating the virtues of some of the changes that have since been made to it. We are confident that in these and other cases, not least All Saints' Marlow, the result is an instrument with tonal and stylistic integrity, equipped to fulfill its intended function for many long years.